It’s that time for sappy, cliché thank yous. Sorry to clog your feed with another one, but SPACE is feeling particularly warm and fuzzy this year, and we would be remiss if we didn’t publicly go on record to tell the world: THANK YOU FOR GIVING US A CHANCE. WE LOVE YOU MORE THAN CUPCAKES WITH SPRINKLES, THE GLEEFUL LAUGHTER OF CHILDREN AND FUZZY LITTLE KITTENS. All of our clients, from jobs big and small. You are the reason we’re here, and we’re humbled you selected us to design the special space you will live, work or play in. Competition is tight out there, and you made us feel like a zillion dollars by giving us the chance to create a beautiful space for you. There has been something compelling and exciting about each and every project, and we’re glad we get to keep designing and building stuff for you. SPACE’s staff. We weathered the storm together, and things are [cautiously] looking up. You are a talented cast of characters, and your creativity and hard work has helped make the firm what it is today. And you’re well-rounded people to boot, so we always have a fun and exciting culture around the office. Atomic Cowboy, for keeping us well-fed and close to the office all year round. The always-evolving urban environment of St. Louis for keeping us grounded and making us consider the diverse and often-complicated context in which we design and build. Websites like Contemporist for reminding us to think big. Websites like Coffee With an Architect and Architexts for reminding us to not take ourselves too seriously. Visits from students and neighbors. Moving our office to The Grove was one of the best things we’ve ever done, and it’s our pleasure to open our doors for student tours, art openings and other special events. We always like to see new faces in our space, and we’re proud to call the Grove our home. From all of us to you and your families, have a happy Thanksgiving. We sure will. 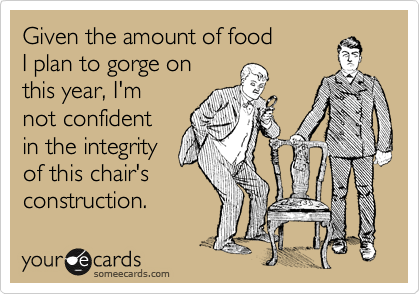 And don’t forget to call us tomorrow if you need help reinforcing your dining chairs.